We’d love your help. 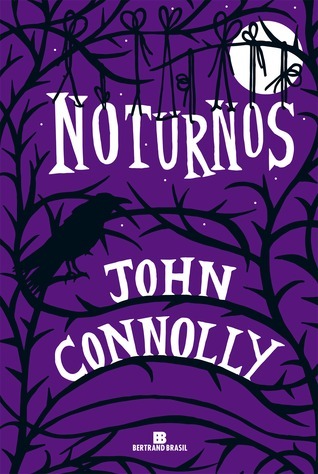 Let us know what’s wrong with this preview of Noturnos by John Connolly. To ask other readers questions about Noturnos, please sign up. The cover says this book is terrifying and delightful I don't know about terrifying, but it is mostly a delightful read. Framing a collection of short stories, three of which had never previously been published are two novellas, The Cancer Cowboy Rides and The reflecting Eye which features Charlie Parker. There were a couple of short stories near the beginning of the collection I did not particularly like, but the rest were really good, particularly the Inkpot Monkey. In my opinion, the two novell The cover says this book is terrifying and delightful I don't know about terrifying, but it is mostly a delightful read. There were a couple of short stories near the beginning of the collection I did not particularly like, but the rest were really good, particularly the Inkpot Monkey. In my opinion, the two novellas were the highlights of this collection. A really good collection of short stories that I read in the beginning of 2014. Usually, the quality of short stories varies very much, but I think this is one of the best collections of short stories I have ever read. Then again, this is John Connolly, writer of the excellent Charlie Parker series. So of course, these stories must be good! My only problem with John Connolly's short stories is just that - they are short! When I read his books I want at least 450 pages of goodness. Nevertheless Nocturnes is really good. It did help that it includes a Charlie Parker novella, The Reflecting Eye, especially as it is about The Collector who features so notably in the main series. I enjoyed that very much. Another novella length piece, The Cancer Cowboy Rides, was wonderfully disgusting, telling the tale of a man carrying and passing on a My only problem with John Connolly's short stories is just that - they are short! When I read his books I want at least 450 pages of goodness. Nevertheless Nocturnes is really good. It did help that it includes a Charlie Parker novella, The Reflecting Eye, especially as it is about The Collector who features so notably in the main series. I enjoyed that very much. Another novella length piece, The Cancer Cowboy Rides, was wonderfully disgusting, telling the tale of a man carrying and passing on a fearsome disease. Of the short stories I really enjoyed The Inkpot Monkey and Miss Froom, Vampire, but none of the stories let the book down. Connolly has just the right touch when it comes to spooky. The creepiest tale of course had to involve clowns. Some Children Wander by Mistake shows a whole new aspect of these unpleasant creatures and quite frankly I hope never to see a clown again. I'll be the first to admit I'm not a huge fan of short story compilations. While I've only read a handful of collections, I find they take a lot of effort to get through. It's not that the quality of the work isn't up to par with that of a full length novel, it's just the ending of one story followed by the beginning of another can sometimes come across as exhausting. You get all invested in a story and it's characters and all of a sudden, it's over. Then, you begin again. Seeing as Connolly is o I'll be the first to admit I'm not a huge fan of short story compilations. While I've only read a handful of collections, I find they take a lot of effort to get through. It's not that the quality of the work isn't up to par with that of a full length novel, it's just the ending of one story followed by the beginning of another can sometimes come across as exhausting. You get all invested in a story and it's characters and all of a sudden, it's over. Then, you begin again. Seeing as Connolly is one of my favorite authors, I decided to give him the benefit of the doubt and check out his short story collection, Nocturnes. It also didn't hurt that he included a Charlie Parker novella smack dab in the middle. The book kicked off strong with The Cancer Cowboy Rides Again. Not a lot of background is given up front regarding the main character but that only adds to the horror surrounding his existence. A story about a man that needs to pass along his disease to hold off death was pretty terrifying. Solid story. Some great storytelling with Mr. Pettinger's Daemon, Nocturnes and especially with The New Daughter. The New Daughter must have grabbed someone the right way as it was adapted for the big screen with a starring Kevin Costner. Haven’t seen the film yet but I plan on it. Without a doubt, the crown jewel of this collection is Charlie Parker's The Reflecting Eye. This is by far, one of the best Parker appearances in Connolly's canaan. Not only is the story's villain both engaging and creepy, the novella is an important one as it debuts one of Parker's most notorious adversaries, The Collector. Connolly actually re-released this tale as a standalone book last year prior to the release of The Wrath of Angels, which also involves a key role for The Collector. I believe it was a limited release but I'm sure you can still find a few copies floating around. Nocturnes is one of the few overwhelmingly positive experiences I've had with a short story anthology. Nothing really drags here as Connolly moves things along briskly - especially with the placement of the Parker novella right in the middle. If you're a Parker fan, you really need to read The Reflecting Eye above all else. This is one of the best story collections that I have read. Nocturnes is a great title as the stories are truly the stuff that nightmares are made of. It is rare that a single author collection doesn't have one story that would be better off in the dustbin but that is the case here. Even the worst story is pretty darn good. On a side note, as Connolly is the author of the excellent Charlie Parker detective series I thought that some of the stories in this collection, particularly The Underbury Wi This is one of the best story collections that I have read. Nocturnes is a great title as the stories are truly the stuff that nightmares are made of. It is rare that a single author collection doesn't have one story that would be better off in the dustbin but that is the case here. Even the worst story is pretty darn good. On a side note, as Connolly is the author of the excellent Charlie Parker detective series I thought that some of the stories in this collection, particularly The Underbury Witches featuring Inspector Burke and Sergeant Stokes, could serve as a seed for another series, sort of a Scotland Yard/X-Files/Hound of the Baskervilles mash-up. Just a thought in case Connolly ever reads this review. FYI: Nocturnes is considered book 4.5 of the Charlie Parker mystery series as it includes the novella, The Reflecting Eye which includes significant events in the Charlie Parker story arc. The Cancer Cowboy Rides : An isolated little town to which evil comes shambling in cowboy boots. Buddy the Cowboy isn’t a shade of grey, he is mindless evil with a mind as dark as pitch. The gore factor in this story is pretty high but considering what Buddy carries within him, this is quite justified. 5 stars. Mr. Pettinger's Daemon : An old church with the images of benevolent and benign deity upstairs and something ancient and evil downstairs form the crux of the story here. This is a very small tale even by the standards of the book. Nothing very outstanding. 2 stars. The Erlking : There is something in the woods just beyond the windows of your home and as darkness falls, the trees whisper to each other and like the darkness itself comes The Erlking. The unspeakable horror that such an entity can emblazon onto a young mind and the defiance of a child against this horror is what the tale is all about. 3 stars. The New Daughter : We go around our lives while believing that the people and things in our life shall forever retain a semblance of normalcy. What if such a person slowly evolves into something (note the word some’thing’) that you can no longer recognize ? What if that something is primal and bestial ? Now imagine if that something was your own child ! This is a creepy story and the backdrop of an abandoned home and an isolated family spreads the dread. 4 stars. The Ritual of the Bones : The closed ranks of an ivy league school is where this tale begins and ends. While it does have its moments, this is not a great story per se. It has a faint whiff of a cliché. 2 stars. The Furnace Room : Crime always pays in the end and so says this tale. The Furnace Room is a dreamy take on how we reap what we sow. Then again it is a very cliché story. 2 stars. The Witches of Underbury : A centuries old curse and a trio of witches go head on with modern law enforcement (modern in the early 1900’s). The strength of this tale is in the trio of witches – the solemn/serious, the flirtatious/dangerous and the unwilling/naïve accomplice. The story is slightly novella length and executes itself beautifully. 4 stars. The Inkpot Monkey : A twisted fable with a very dark sense of humour. 3 stars. The Shifting of the Sands : Here’s to Lovecraft and the elder Gods ! With love – John Connolly. 3 stars. Some Children Wander By Mistake : Considering how scary clowns are, why do people invite them to be close to their kids ? Wasn’t Pennywise warning enough ? 3 stars ! Deep, Dark Green : A lyrical story about a fleeting comfort that awaits the unwary in deep, dark and green waters. The story is like water as it flows all around you and as you bask in its comfort, a sudden pull from beneath drags you under and then there is only darkness. 4 stars. Miss Froom, Vampire : A humorous take on an aging female vampire and her dull life in a small neighbourhood. What do we do with retired vampires ? 3 stars. Nocturne : When the night falls and the last light goes out, the dead come out to play. Good old ghost story. 3 stars. The Wakeford Abyss : Crevices in the earth within whose deep, dark hollows dwell things which are better off undisturbed. Two explorers rappelling down such a crevice come face to face with a chitinous horror. 4 stars. The Reflecting Eye : A haunted mansion gets a full makeover in this story and it also introduced me to Connolly’s iconic character – Charlie Parker. While copycat killers have been overused to the point of blandness in multiple stories, here the focus is on an entirely different antagonist. Connolly lays down the ground work for making The Collector a much more formidable presence in his books to come. This story however has a logical ending. A whodunit with elements of horror thrown in to just the right levels. 5 stars. Mr.Gray’s Folly : Connolly seems to have an attraction to ancient evil and how it can come back to haunt you after generations. Mr. Gray and his wife living in a palatial mansion fall prey to such a curse. Not a very original story. 2 stars. The Cycle : The tale with a twist and Connolly pulls a Jeffery Deaver here. There are however clues scattered all through the story : the full moon, the aches in the body, fur and claws….’nuff said. 4 stars. The Bridal Bed : True love beckons to one even from beyond the grave. How far would a man go to reach his one true love ? 3 stars. The man from the second fifteen : Never stop your car on a strange and deserted stretch of the road. No matter what ! 3 stars. El irlandés John Connolly es mundialmente conocido por las novelas protagonizadas por Charlie Parker, y ha demostrado más que de sobra su capacidad para crear atmósferas sobrenaturales. Siempre pensé que Connolly sería un buen escritor de relatos cortos, y con ‘Nocturnos’ lo ha conseguido con creces. Sus relatos recuerdan a los autores de fantasmas más reconocidos, M.R. James, E.F. Benson o Joseph Sheridan Le Fanu, pero también hay elementos de Stephen King, e incluso algo de Clive Barker. A lo l El irlandés John Connolly es mundialmente conocido por las novelas protagonizadas por Charlie Parker, y ha demostrado más que de sobra su capacidad para crear atmósferas sobrenaturales. Siempre pensé que Connolly sería un buen escritor de relatos cortos, y con ‘Nocturnos’ lo ha conseguido con creces. Sus relatos recuerdan a los autores de fantasmas más reconocidos, M.R. James, E.F. Benson o Joseph Sheridan Le Fanu, pero también hay elementos de Stephen King, e incluso algo de Clive Barker. A lo largo de los diecinueve relatos incluidos en ‘Nocturnos’, Connolly nos acerca al horror más primario, la mayoría de las veces desde un escenario cotidiano, y otras veces desde lugares macabros y tenebrosos. Son relatos de corta extensión, excepto el primero. En ellos nos encontramos los elementos más comunes del mal: un enigmático vaquero que se dedica a contaminar a otras personas, criaturas ocultas en iglesias, bestias subterráneas, embalses malditos, extraños payasos, brujas ocultas, mujeres lobo, elfos, vampiros. En resumen, estamos ante una muy buena colección de cuentos que disfrutará cualquier amante del género. Señores que este jefazo es todo un ESCRITOR. Es lo primero que leo y no descarto leer sus novelas detectivescas (aún sabiendo que no me gusta ese género). Buen terror y tratante de todo su ámbito, con el clásico de fantasmas, psicológicos y otros de criaturas monstruosas. Enfermedades oscuras y confusiones familiares. Ninguno malo, lo cual es un éxito en una recopilación de relatos. Si te gusta el terror: LEANLO. Absolutely fabulous collection of horror stories. Loved it, loved it, loved it! I read that novella first and it fit into the series perfectly, preci Absolutely fabulous collection of horror stories. Loved it, loved it, loved it! I read that novella first and it fit into the series perfectly, precisely, pointedly. Then I read all the other stories. Some are long shorts;, some are shorter, but not a one is less than wonderful. Scary, poignant, heartfelt, horrifying, weird, creepy - you name it, it's here; and better yet, Mr. Connolly is a skilled and articulate writer. I just love his descriptions. Transitions, dialogue, setting, sense of place and all that, it's here in spades. He has another collection; I'm going to read that one, too. Can't wait! And by the way, I read most of this particular book while alone in a spooky house with the windows open (screened windows) and the sounds of screech owls and crickets and the occasional cries of children at play in the background. (And yeah, in the dark of early evening.) Loved that, too. Pretty good collection, I really enjoyed The Cancer Cowboy Rides Again, The Underbury Witches, Nocturne and Deep, Dark Green. But the Charlie Parker novella The Reflecting Eye pushed it up to 4 stars. "The Cancer Cowboy Rides" - This was a quite chilling and remarkably grotesque story about a living cancer, embodied in "Buddy". A truly disgusting story, it was certainly entertaining and a quite solid short story. "Mr. Pettinger's Daemon" - A much shorter story, but no less eerie and very reminiscent of The Descent... this one would be good for expansion, as many questions to the nature of the Beast have gone unanswered. The most interesting tidbit was the reference to the cannibalism of WWI... I wonder if that is actually based on historical record. "The Erlking" - An eerie short story that reminded me of The Book of Lost Things more than anything else he's written so far. I thought I read somewhere that this one was going to be expanded into a screenplay, that I would certainly be interested in seeing! This one is the most fairy-tale-like so far. "The New Daughter" - Yikes... this was by far the creepiest story... and the best so far as expansion into a movie, I think. This one is my favorite so far... so creepy! I do hope that the movie is made! I would definitely see it - though I might be a bit scared to! "The Ritual of the Bones" - Ehhh... gross, but this one wasn't as darkly enchanting as the previous two. All in all, an average scary story. "The Furnace Room" - An interesting twist of Hear-No-Evil, See-No-Evil and Speak-No-Evil, mixed with the Fates... fun and quick, but not terribly thought provoking. "The Witches of Underbury" - The is was a very interesting short story and it would be interesting to learn if the actual witches in that town are based on a true story. "The Inkpot Monkey" - A "cute" scary story, focusing on the "hazards" of writer's block. More funny and quaint than creepy, but still an enjoyable story. "The Shifting of the Sands" - The problem with these short stories is that they are so... short. They are intriguing and do have a beginning, middle and usually a rather haunting open ending, but the would be better with more detail, stronger characters... in other words, length. "Some Children Wander By Mistake" - A clown story - yikes! Though a pretty typical scary story and not too terribly unique. "Deep, Dark Green" - Something about this short story reminded me of a poem... there was just something oddly poetic about it. "Miss Froom, Vampire" - What a fun little vampire story! I just love a fun vampire story - who doesn't? "Nocturne" - A more typical ghost story - still eerie, but not anything very remarkable. "The Reflecting Eye" - I was surprised that this Charlie Parker story was included, though I did enjoy it and it did bridge some of the gaps around his daughter's birth. He is a very good writer, with a real talent for humourous dialogue, building suspense and inclusion of "normal" paranormal activity. The ending certainly surprised me, though some questions were left quite unanswered. It just makes me eager for the next Charlie Parker novel!! I really have a love and hate relationship with horror short stories. Every now and then I really love one and it affects me. Yes, Shirley Jackson I'm talking you! This was my first book by John Connolly and it really wasn't the best one for me to pick. I should've started with "The Book of Lost Things." I will still get to that one though, I think it will be more my style. I listened to this one on audio. It took me forever. To be fair, it always takes me longer on audio because I'm antsy. I've been trying to get better at listening to them though because they can be an amazing thing. That was not really the case with this one. Narrator, Jeff Harding, did horrible accents. I cringed every time he did a woman's voice. It probably took away from a lot of the stories. I liked a couple of the stories. Most of them I had a hard time keeping focus because I kept getting bored. I did like Cancer Cowboy, New Daughter and the one about the clowns (can't think of the name right now). I can't really personally recommend it since I didn't enjoy it but I also wouldn't say not to read it. Lots of people seem to really like this one, so if it sounds like something that might interest you then go for it. It certainly wasn't badly written. I would NOT recommend the audio on this one though. In every one of these short stories Connolly succeeds in raising my neck hairs, even if at times it is only a small bit. I like to think that I'm immune to the average horror story atmospheres and tropes which is to say that for an author to have any pull on my emotions they must do either A) take the normal horror game to new heights or B) Do something completely off the wall altogether. Connolly does a mixture of both of these options which produces many diverse and refreshing stories. I reall In every one of these short stories Connolly succeeds in raising my neck hairs, even if at times it is only a small bit. I like to think that I'm immune to the average horror story atmospheres and tropes which is to say that for an author to have any pull on my emotions they must do either A) take the normal horror game to new heights or B) Do something completely off the wall altogether. Connolly does a mixture of both of these options which produces many diverse and refreshing stories. I really appreciate it when an author can mould both a plot and character so well in under twelve pages, especially from an author who is in no way renown for his skills at the short story. Having said that, Connolly is not going to win any prestigious literary awards for work like this, but it definitely serves for those not wanting to sleep too soundly at night or who are interested in feeling the side effects of book induced paranoia. Generally I consider most short story collections a mixed bag at best, unless your name is Stephen King. And the reason I read this one is firstly the inclusion of a Charlie Parker story, which was imho the best story in the book at the same time. Secondly I was kind of curious how mr. Connely did do outside of "Charlie Parker universe". And while he did not really dissapoint he did not always deliver as good. I did enjoy the opening novella and the short story on the Witches, which might have b Generally I consider most short story collections a mixed bag at best, unless your name is Stephen King. And the reason I read this one is firstly the inclusion of a Charlie Parker story, which was imho the best story in the book at the same time. Secondly I was kind of curious how mr. Connely did do outside of "Charlie Parker universe". And while he did not really dissapoint he did not always deliver as good. I did enjoy the opening novella and the short story on the Witches, which might have been more interesting had it been taken as the seed for a novel on its own. Most of all I find the art of short story writing to be far more difficult for any writer and Connolly does not always make the stories come alive in the same sense he does with his longer novels. When reading this book I kept thinking: "I'd read something like this before! ", so perhaps I did read plenty of those short stories from somewhere else in the past. Plus, John Connolly's themes, style and writing reminds me strongly of Clive Barker's short stories, I'm not saying who is ripping off who, but the resemblance is still strong. El relato de terror más académico no puede ser mucho mejor que el de Connolly. Cuentos de gran solidez, con momentos inquietantes y que se leen de principio a fin con la mirada pegada a sus bellas palabras. Difícil encontrar a alguien que pueda detestar esta literatura. Cómo escribe, Connolly. Es la primera vez que lo leo, pero la sensación (en la que muchos coinciden) es que no solo conoce su oficio, sino que lo desempeña con la maestría del mejor artesano. Del artesano que, incluso, tiene deste El relato de terror más académico no puede ser mucho mejor que el de Connolly. Cuentos de gran solidez, con momentos inquietantes y que se leen de principio a fin con la mirada pegada a sus bellas palabras. Difícil encontrar a alguien que pueda detestar esta literatura. Cómo escribe, Connolly. Es la primera vez que lo leo, pero la sensación (en la que muchos coinciden) es que no solo conoce su oficio, sino que lo desempeña con la maestría del mejor artesano. Del artesano que, incluso, tiene destellos de artista. Porque no son raras las frases de gran lucidez, los detalles que toman una escena potencialmente mediocre y le aportan el toque justo que las eleva hasta hacerlas fascinantes, evocadoras y, casi, hermosas. La traducción es igualmente excelente, de gran elegancia y con la palabra justa siempre a tiempo. Algo le impide terminar de arrasar y es su academicismo; la literatura sin vanguardismo tiene unos límites, a los que se acerca Connolly pero le falta el extra. El extra de valentía, de deseo de ruptura, de ir más allá. Las historias son en exceso previsibles. Es obvio que el autor no busca la originalidad, sino la eficacia, la perfección de una forma clásica que disfruta elaborando por sí mismo, desplegando toda su pericia estilística e imaginación. Se nota el placer del escritor. Pero siempre en los márgenes de lo ya visto. Los ecos son tantos que son probablemente autoconscientes, más temáticos que estilísticos: James y Benson en los relatos de terror parroquial; una de las historias más Poe que he leído en el siglo XXI en 'El capricho del señor Gray'; por supuesto, retazos lovecraftianos en, por ejemplo, 'El abismo de Wakeford'; la influencia del horror moderno de King y Barker, superando al primero en su campo ('Profundidades verdes y oscuras', 'El vaquero del cáncer cabalga') y encontrando cierta afinidad con el segundo ('La sala de la caldera'). Hasta el Kafka satírico se deja caer por 'El mono del tintero'. El estilo de Connolly, por otro lado, tiene un deje del autor de novelas que no termina de adaptarse al formato corto. Muchos de los cuentos comienzan con una lentitud casi excesiva, al detenerse en descripciones de lugares y personajes como lo haría el primer capítulo de una novela, pero rara vez se ve en el relato breve con tanta claridad. Connolly usa esos arranques para desplegar los temas y símbolos de cada historia, pero como un novelista o, como mucho, un cuentista algo pasado de moda. La previsibilidad de las historias es lo que ralentiza esos inicios. Aun así, sus estructuras por lo general terminan funcionando y varios de los clímax son inolvidables. De nuevo, gracias a ciertas frases. En definitiva, es un libro de gran solidez en todos los aspectos, muy disfrutable y no solo como divertimento ligero. Apenas hay historias que bajen el nivel ('El ritual de los huesos' o 'Las brujas de Underbury' se acercan a la mediocridad, sin grandes puntos de salvación, aunque sin molestar) y en casi todas hay descripciones físicas (la mayor parte de sus horrores son criaturas y demonios) con destellos de tremenda potencia evocadora. Entre mis favoritos, por afinidad personal y no porque destaquen por encima de otros, diría 'Profundidades verdes y oscuras' o 'El lecho nupcial', ambas de intenso arrebato romántico. Съвременните тинейджъри сигурно си мислят, че това е заглавие от поредицата "50 нюанса сиво"... обаче не е. Напоследък реших да си припомня някои от разказите в този страхотен сборник на Джон Конъли (ах, тия ирландци, все страхотии са им в главата). Истинска загадка е как някои автори улавят толкова концентрирана есенцията на мрака, за да я влеят в произведенията. Като че ли това е най-силното в "Нощни приказки" - атмосферата, която прави тъмнината покрай теб по-пълна, а книгата - едно приятно малко нощно четиво. Малко въпреки своите 400 страници... та цялата книга се чете едва за нощ или две. Това зависи само колко от нея искате да прочетете наведнъж. Можете ли да устоите само ден, за да ѝ се насладите още една вечер? Да чакате с нетърпение да я разгърнете отново, докато мракът навън се сгъстява. Ще можете да си припомните най-доброто от света на ужаса, да минете през много от етапите му на развитие, да се отдадете на слова, напомнящи ви на много други автори, които възхвалявате. "Демонът на Петинджър" - стара църква, под която се крие древно зло, надминаващо и най-големия космически страх във вселената. Къс разказ, сякаш написан от Лъвкрафт или някой от неговите учители, но с по-живо действие и напрегнатост, нагнетяваща всяка молекула в атмосферата. Но електрическият заряд продължава да набира енергия през всяка брънка от изкусно написания текст на Конъли - "Горският цар" е истински шедьовър на ужаса, който ще ви кара да погледнете със съмнение към прозореца, особено ако сте го разтворили. Детските страхове са любима тема на много писатели. Мрачните създания, които ги населяват - не по-малко отъпкана почва. Той е тук - Н. В. Царят на Гората, с гердан от човешки черепи, с корона от крехки кости на деца. И иска да ви вземе със себе си. Твърде странно е. Прочетох тази книга преди години, а спомените ми са толкова пълни. Когато я препрочитам помня почти всичко от нея. Настръхвам само само като си помисля какво ще последва. Това изобщо не ми пречи. Зная какво ще се случи и именно от тази предизвестеност ме побиват тръпки, начинът, по който я представя Конъли, плаши. Това е достатъчно. Принуден съм да заговоря за "Пещта" - разказ изкаран сякаш от най-отвратителните ви кошмари, където ужасът идва без лице в нощта, за да ви стресне. Да, текстът стряска. Буквално. Това е най-брутално психопатския разказ от всички. В него няма гадости. Има психология, която ще изпие вашата. Казвате ми, че имате здрава психика? Не сте прочели това... всичките ви малки тайни ще излязат наяве. Почти като в "Шилигфордският хан" - там възмездието идва само, години след ужасната постъпка, която го поражда и е гадно, да тук вече е гадно и мистериозно като в криминална загадка. "Брачната постеля" е още нещо посветено на лудостта и различните ѝ вулгарно-брутални измерения, в която побъркан от скръб ненормалник е обсебен от тялото на мъртвата си годеница. Не искам да го видя в киното, но ми се ще да чуя коментарите на зрителите. Но няма да се напише нищо за книгата, ако не бъде споменат един от най-запомнящите се разкази в нея. Прелестната "Госпожица Фрум - вампир", с който Конъли печели наградата "Брам Стокър". Тя е омайна, тя е красива, тя облича екстравагантно и привлекателно, тя пие кръв... Заложен ли е вампиризмът в женската природа и защо мъжете не могат да му устоят? Мъжете са твърде отзивчиви в опитите си да се харесат на някоя жена. Коварни жени? "Ъндърбърдските вещици" са от същата класа. Изкусителни магьоснички? Или просто налудничава секта? Няма как да знаем докато не разкрием убийството на местен жител. Малките градчета са много различни. Ако се разходиш по улиците на метрополиса, навсякъде блести неон, навсякъде щъкат хора. В глухата провинция нощите са по-тъмни. "Ноктюрно" е страховит разказ за призрак на дете, обитаващ прокълната къща, и новите ѝ обитатели. Класическа постановка и брилянтно изпълнение. When I have some downtime, I'm working my way through the audio versions of John Connolly's Charlie Parker series. I've read the series a number of times, but listening to them has been revelatory--mainly in how overly fast I read and how much I actually miss! So, having that excellent reader's voice in my mind, I've just started reading this new (to me) Connolly book of short stories. Great stuff so far. I'll update when done. I finished this great little collection last night and highly recomme When I have some downtime, I'm working my way through the audio versions of John Connolly's Charlie Parker series. I've read the series a number of times, but listening to them has been revelatory--mainly in how overly fast I read and how much I actually miss! So, having that excellent reader's voice in my mind, I've just started reading this new (to me) Connolly book of short stories. Great stuff so far. I'll update when done. I finished this great little collection last night and highly recommend it to anyone who is a Connolly fan. For one thing, there's a Charlie Parker short which is the missing link, if you like, in his series: it introduces The Collector, one of the books' most enigmatic villains. But that story aside, the whole book is full of intriguing and unsettling horror stories. Unlike Stephen King, Connolly is subtle in his horror--there's very little gore in the stores (compare Clowns are Born with King's IT, for example). But if you want atmospheric creep, thought-provoking moments of self-doubt then give these a go. Unlike the Parker series, these are mostly from Connolly's British/Irish background and the settings are very evocative of our damp, chilly isles with their very, very long history. A collection of creepy stories -nothing more and nothing less. If you're going to read this, I'd recommend reading it during the Halloween season. I'm sure people can enjoy the book outside the constraints of Halloween, but I'd imagine it's less fun. I gave this one 3 stars because there are some 2 , 3, 4, and 5 star stories. 3 seemed like a good average; it also means that this book is worth the read. I'm almost positive that everyone can find at least one story they enjoy. On the flip side, it also means that you read some stories you enjoy less. My favorite was probably The Erlking. A wonderful selection of short stories from Mr Connolly, including one featuring Charlie Parker (The Reflecting Eye) , I re-read these, some each night over the last little while (February 2014) and once again was enthralled and delighted by each of them. There is a great mix here – my favourite being “The Underbury Witches” – I do like a good evil witch story – closely followed by “Some Children Wander By Mistake” which, frankly, freaked me out, anyone who has the clown phobia should beware! The A wonderful selection of short stories from Mr Connolly, including one featuring Charlie Parker (The Reflecting Eye) , I re-read these, some each night over the last little while (February 2014) and once again was enthralled and delighted by each of them. The Reflecting Eye, as well as telling us a bit more about Mr Parker, introduces a villain (hero? I kind of love him!) that those of us who follow the series avidly will come to know well – The Collector – as such it will remain with me until Charlie’s story comes to an end, whenever that may be. You will also find a fun filled little vampire story and a creepy atmospheric ghost story amongst other things – I will leave you to discover for yourself. Let me know which one gave you the nightmares! “Aun me cuesta creer que algo viva allí abajo. Porque lo que hay allí abajo no vive. Cuentos para un conductor solitario en medio de la noche, no hay mejor manera de describir esta joya de libro. Reminiscencias e influencias de todo tipo, terror gótico, Stephen King, Poe, Lovecraft, Barker incluso, comedia de terror, etc. calculadas con precisión de relojería por uno de mis autores favoritos. Connolly logra una antología excelente, macabra y obscura para disfrutar como niño. “Aun me cuesta creer que algo viva allí abajo. Cuentos para un conductor solitario en medio de la noche, no hay mejor manera de describir esta joya de libro. Reminiscencias e influencias de todo tipo, terror gótico, Stephen King, Poe, Lovecraft, Barker incluso, comedia de terror, etc. calculadas con precisión de relojería por uno de mis autores favoritos. Connolly logra una antología excelente, macabra y obscura para disfrutar como niño. This is a very strong collection of horror stories, which are quite different in tone and style. I like most the ones, which are connected with the legends about ancient faerie or divine creatures - with them Connely touches the greatness of H.P. Lovecraft. John Connolly comienza su recopilación de relatos con “El vaquero del cáncer cabalga”, una narración digna del mismísimo Stephen King, y ya no pierde interés en ninguno de los 19 relatos siguientes. Como es lógico, algunos están más logrados, pero el maestro del terror da sobradas muestras de porqué es un número uno en ventas en su terreno. Sabe infundir miedo, y lo que es mejor, sabe escribir como los ángeles, aunque sus historias nos transporten al lado contrario. A ese inframundo que John Con John Connolly comienza su recopilación de relatos con “El vaquero del cáncer cabalga”, una narración digna del mismísimo Stephen King, y ya no pierde interés en ninguno de los 19 relatos siguientes. Como es lógico, algunos están más logrados, pero el maestro del terror da sobradas muestras de porqué es un número uno en ventas en su terreno. Sabe infundir miedo, y lo que es mejor, sabe escribir como los ángeles, aunque sus historias nos transporten al lado contrario. A ese inframundo que John Connoly describe como si fuese el propio Lucifer. Estos relatos fueron originalmente concebidos para su emisión en la cadena de radio 4 de la BBC (Una cadena de la que soy fiel seguidor, y en la que he descubierto auténticas maravillas. Aconsejo a quienes dominen el inglés que, si no la conocen, se den una vuelta por su página web o se bajen algún podcast). Tuvieron tanta aceptación, que el autor tuvo que escribir una segunda serie. De ahí pasaron al formato libro. Y para mí ha sido un placer poder leerlos conjuntamente. No más de un par al día. Como las buenas esencias, en pequeñas cantidades se disfrutan mejor. The Cancer Cowboy Rides (4 stars) - Interesting idea. Decent character development. Started out good but lost steam near the end. Really no absolution and the ending was choppy. Cut up scenes that didn't really run together into coherence. I mean I guess I understood in the end but he could have kept it smooth like the rest of the story. I think I would have liked him to flesh it out a bit. It could have made a decent book. Mr. Pettingers Daemon (3 stars) - I really liked the atmosphere in this. The Cancer Cowboy Rides (4 stars) - Interesting idea. Decent character development. Started out good but lost steam near the end. Really no absolution and the ending was choppy. Cut up scenes that didn't really run together into coherence. I mean I guess I understood in the end but he could have kept it smooth like the rest of the story. I think I would have liked him to flesh it out a bit. It could have made a decent book. Mr. Pettingers Daemon (3 stars) - I really liked the atmosphere in this. Very dark ages feel. The Erlking (5 stars) - Awesome. Totally 3 dimensional. Creepfest 101. Loved it. The New Daughter (5 stars) - Why are children so terrifying? The Ritual of the Bones (2 stars) - Boring. The Furnace Room (2 stars) - This one wasn't boring. The problem is that there was obvious (and lame) foreshadowing. Why would you need to use foreshadowing on a story that is only 11 pages long? And this one missed the general creepy feeling I've come to expect from Connolly. Alright, moving forward. The Underbury Witches (5 stars) - This was just a really good story. Connolly, when you have a really good story you have to stretch it out and write a book!! This story was written with interspersing 'historical facts' which I thought added a lot to the story. I don't know if they are legitimate facts or not, hence the quotes, but they added meat to the story. Plus, the clues along the way were interesting. Good old fashioned witch terror. The Inkpot Monkey (3 stars) - Strange little story. Kinda funny and pretty well told. Some Children Wander by Mistake (2 stars) - Snooze. I'm not scared of clowns. I haven't read 'It' yet but they just don't do anything for me. Deep, Dark Green (4 stars) - Excellent writing. Once again, completely visual. Nocturnes (5 stars) - Connolly writes creepy kids very well. He must have a very good idea about what is creepy about kids or how to write a kid opposite to the general fun and fancy free way kids are usually written in books. He makes them seem older than their years, introspective and heavy. Its so opposite to what a normal kid is like that it makes it scary. The Wakeford Abyss (3 stars) - Typical. The Reflecting Eye: A Charlie Parker Novel (5 stars) - Wow! If that is a typical Charlie Parker novel then I'll have to add those to my TBR. Extremely interesting mystery mixed with horror...and very well done horror. This novella was only a little over 100 pages long and I am already a big fan of the Charlie Parker character and supporting characters. The characterization by Connelly is usually may favorite part of his books so I'm happy that is the case with the Parker books. The Bridal Bed (2.5 stars) - I'd have rated this one higher if I was more into stories where people get it on with dead bodies. Eeep. But pretty standard writing. The Man from the Second Fifteen (4 stars) - and thats why you never stop when you hit somebody with your car. The Inn at Shillingford (5 stars) - Very engrossing. Mr. Grey's Folly (3 stars) - Once again a story that may have been improved with a little bit more length and detail. Very interesting premise but needed more meat. I did the math and that comes to an average rating of 3.69 so I'll push that up to 4. I'm officially a John Connelly fan. This is my first Connolly and though I did not love it, I was impressed enough to hunt down The Gate (which I really liked) and plan on reading much more. The Cancer Cowboy Rides : This reads like vintage Stephen King and that is a very good thing. I really liked this story. The Furnace Room : I really liked the descriptions here – the story was far too short for enough development, but the spirits were so creepily depicted, I just couldn't resist this story. The Underbury Witches: Once again, I wished this was longer – it would have only served the story. However, the interweaving of “historical” artifacts within the narrative was effective. I've never read anything else of John Connolly's, but from this collection of short stories, it seems he has real women issues. Every female character fits directly into the succubus category, with sagging breasts, rotting flesh, and a great desire to consume men. To Connolly, it seems that every woman is a Lilith, a witch from which men must escape or die. I guess he's had some bad relationships. I'm a short story fiend so this book really spoke to me. Connolly is a fine writer and these stories are suspenseful and page-turning. I especially like The Shifting of the Sands.